Panerai manufactures what I consider to be the ultimate watch but, unfortunately, these timepieces are well beyond my budget. I’ve tried replicas. My first cost only fifteen dollars and was absolutely beautiful. Over a one-month period, it literally fell apart. My second replica, although far more expensive, began to fail within two weeks. I’d all but given up when I received an unsolicited email from mywatchcode. They were offering the Parnis Marina Militare for fifty dollars plus another six to cover shipping. That seemed suspiciously low. I checked the timepiece on Google and gleaned this information from an article by fellow horologist, Tom Adelstein. 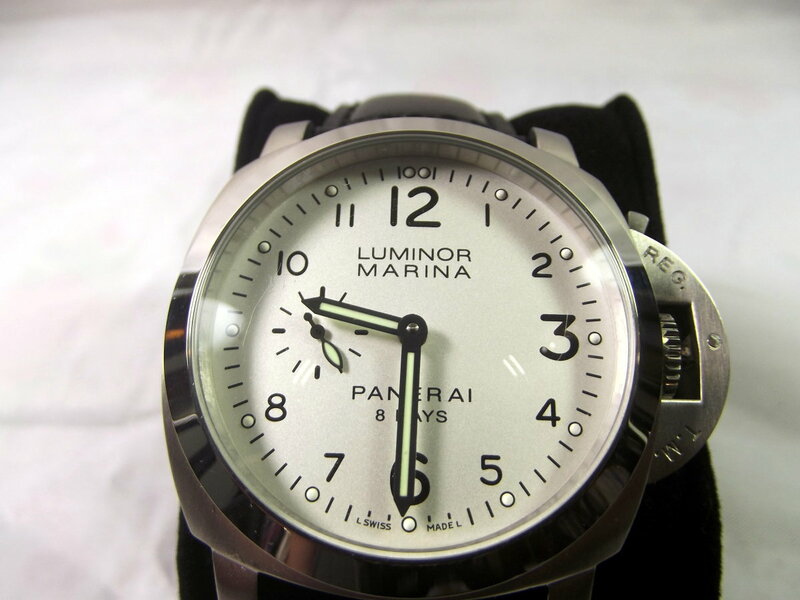 While Parnis’s Marina Militare models are not branded Panerai, they are very close copies. After eight years of work accumulating evidence, Panerai’s parent company, Compagnie Financière Richemont SA, compelled the major eCommerce companies to cease sales of this watch. My understanding is that Parnis Marina Militare models are no longer in production and that all remaining stock is being sold off at discount prices. Since I consider Parnis to be one of the premier Chinese brands, I decided to take mywatchcode up on its offer. The Marina Militare is a hefty mechanical watch, weighing in at 112 grams (4 ounces). With the crown protector included, the timepiece’s diameter reaches 50 millimeters. It is 14 millimeters thick. 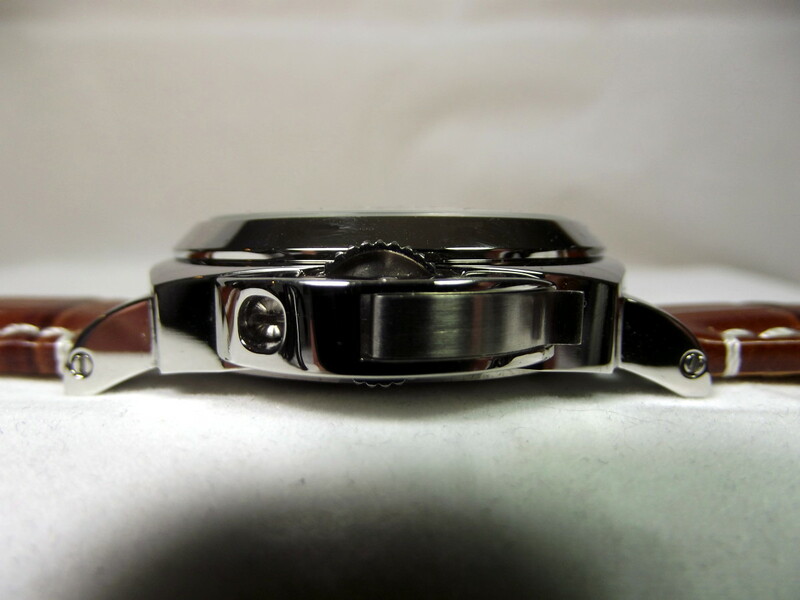 Like every Parnis I have tested, this watch’s case is composed of 316L grade stainless-steel. The crown, which juts from the timepiece’s right edge, is protected by a device very similar to what is fitted onto a genuine Panerai. This watch incorporates a sandwich style dial. The bottom disk is coated with luminous paint. The upper disk is colored black and indicators, representing one through twelve o’clock, are punched out along its outer rim. A subdial at the nine o’clock position keeps track of the passing seconds. All hands are coated with good quality luminous paint. 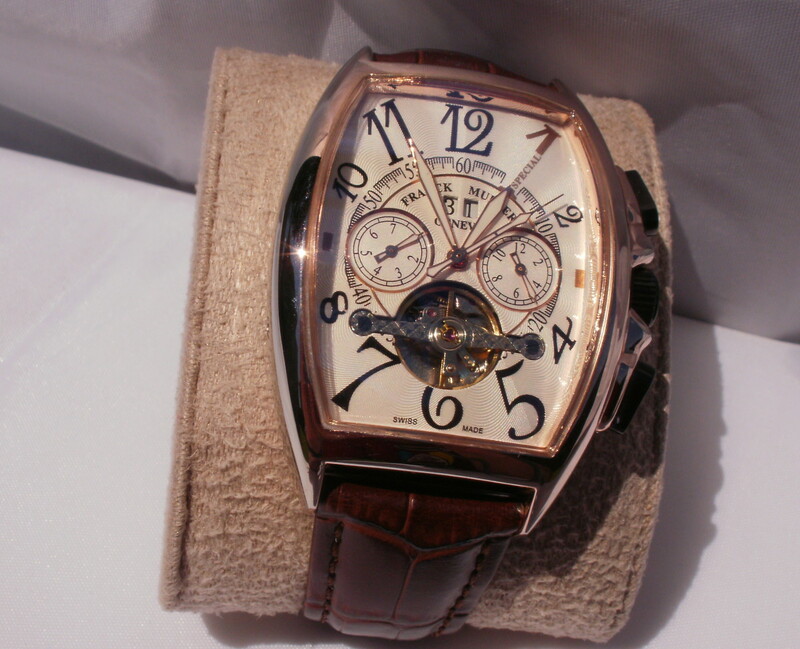 The caseback includes a large, mineral glass window. 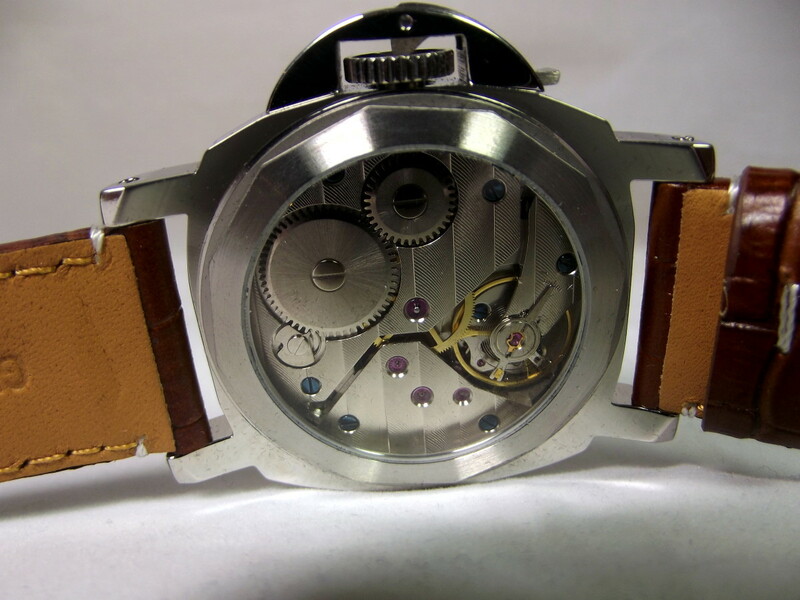 Though it, you can view the workings of an Asian, hand-winding 6497 movement. This timepiece’s crocodile patterned, brown leather strap includes a solid stainless-steel buckle and displays white stitching along its edges. 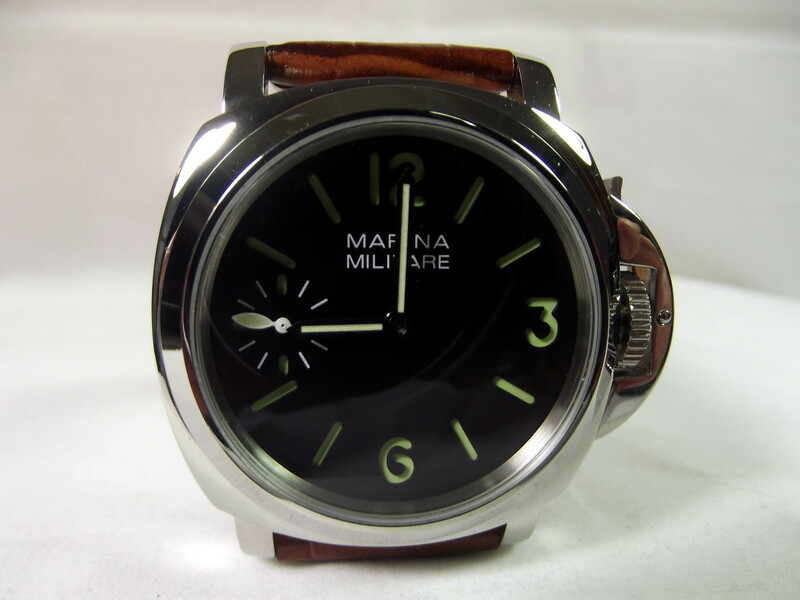 With the exception of the name, Marina Militare, this watch includes no branding information. Parnis designs their own timepieces and assembles them at their manufacturing facility at Tong De Wei, Guangzhou. The various components are contracted out from companies such as Seagull, Miyota and Dixmount. Fu Yuan Xin manufacturers their cases. Parnis produces both mechanical and quartz driven timepieces. Some of these watches, such as the Marina Militare, are intended to closely resemble their Swiss competitors’ more expensive luxury timepieces. Other designs are fresh and original. Because they offer excellent buyer protection, I usually confine my internet purchases to Amazon, eBay, DhGate, and AliExpress. 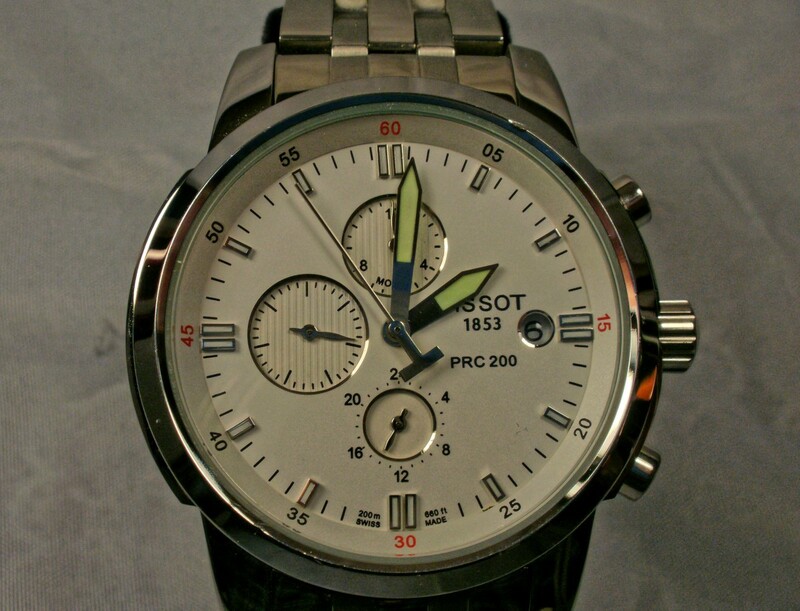 Before buying this timepiece on mywatchcode, I conducted some research. Mywatchcode is registered to HiChina Zhicheng Technology Ltd. HiChina is a China-based web hosting company. HiChina Zhicheng Technology Limited is a wholesale supplier of electronics, apparel, and home and garden supplies. 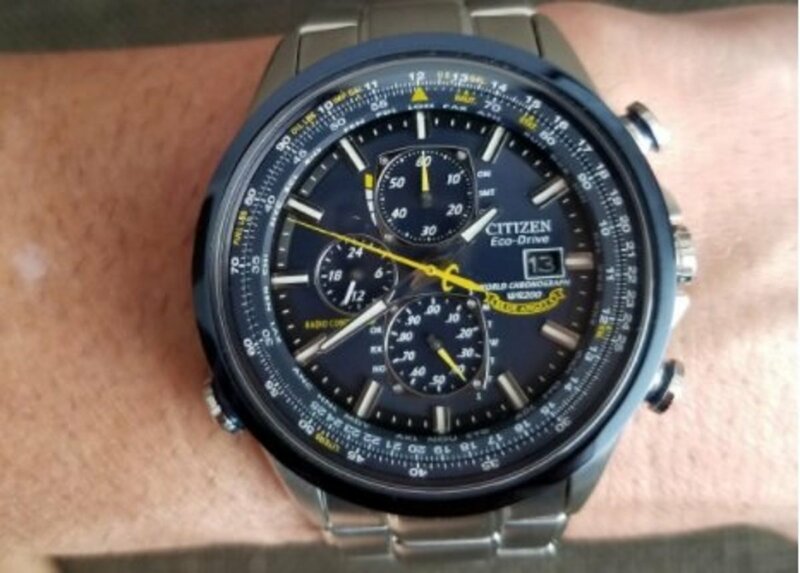 Although this website is separate, they also have a watch store on eBay. This site accepts Paypal, avoiding the need to provide credit card information to a company that has not yet earned my trust. My purchase went smoothly and my new watch arrived on schedule. The Marina Militare’s shiny stainless-steel case is quite imposing and the matching crown protector ensures this watch presents an impression of solid ruggedness. Its black on green dial is subdued and very easy to read. This timepiece’s caseback contains a window which allows a clear view of an engraved, 6497 mechanical movement. 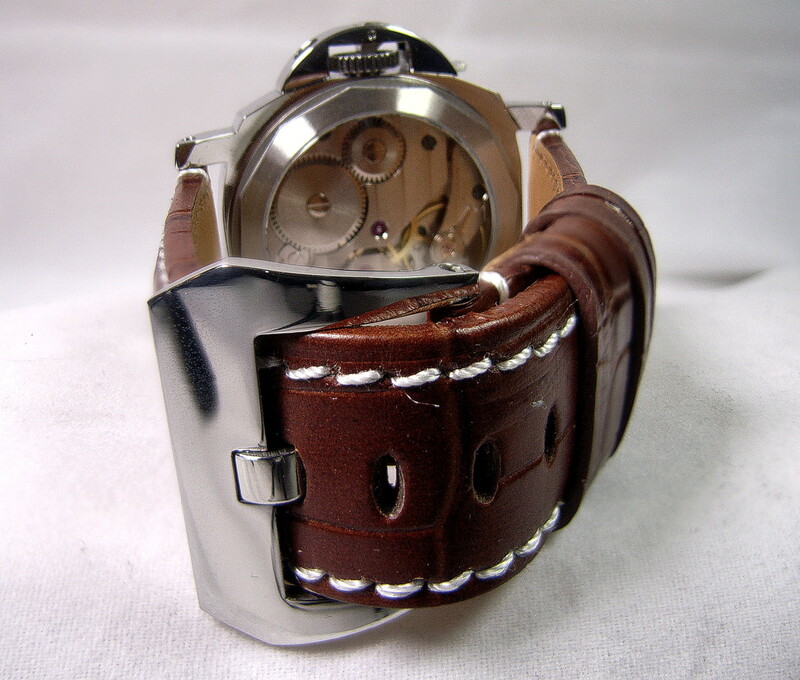 It is equipped with a thick brown leather strap. While I am not a fan of crocodile patterned straps, this one, with its large stainless-steel buckle and white stitching, is particularly well done. I tested the Parnis Marina Militare for five days. During this time, the watch gained 10 seconds. That works out to a commendable two seconds per day. Reserve power is a respectable fifty-nine hours. The Marina Militare’s movement is securely enclosed within a stainless-steel case rated 316L. Only Rolex utilizes a higher grade of steel. 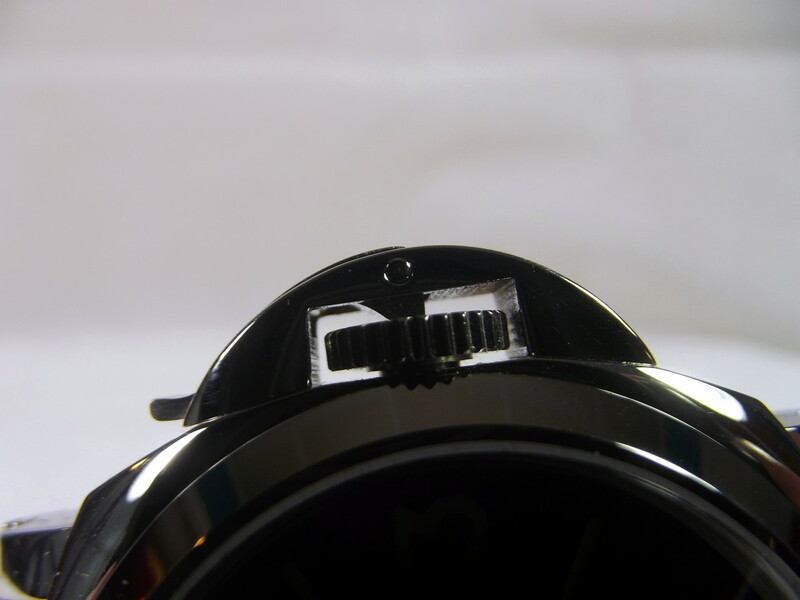 This timepiece is fitted with a crown protector, quite similar but inferior to that found on a Panerai watch. When the lever of the Marina Militare’s crown protector is extended, its far end nudges against the crown, securing it snugly. 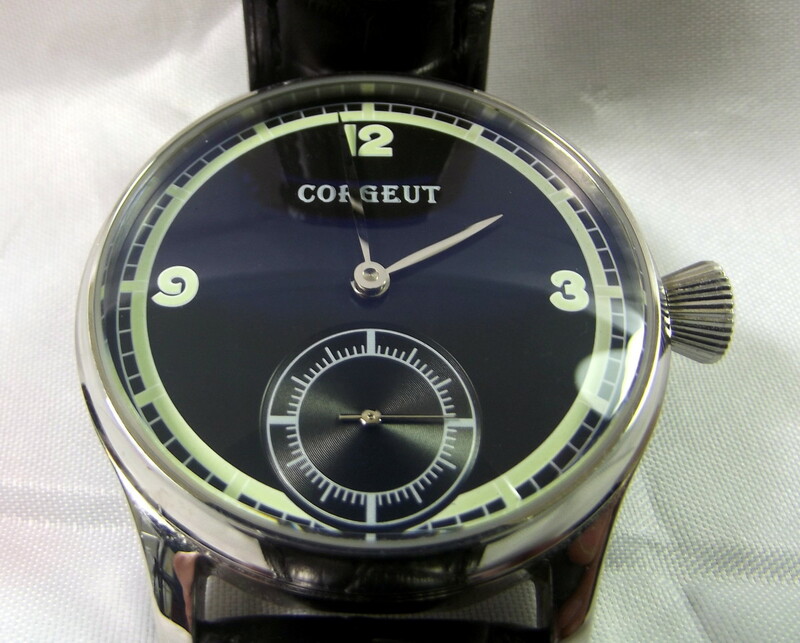 Both the timepiece’s crown and lever are composed of stainless-steel and should wear well. 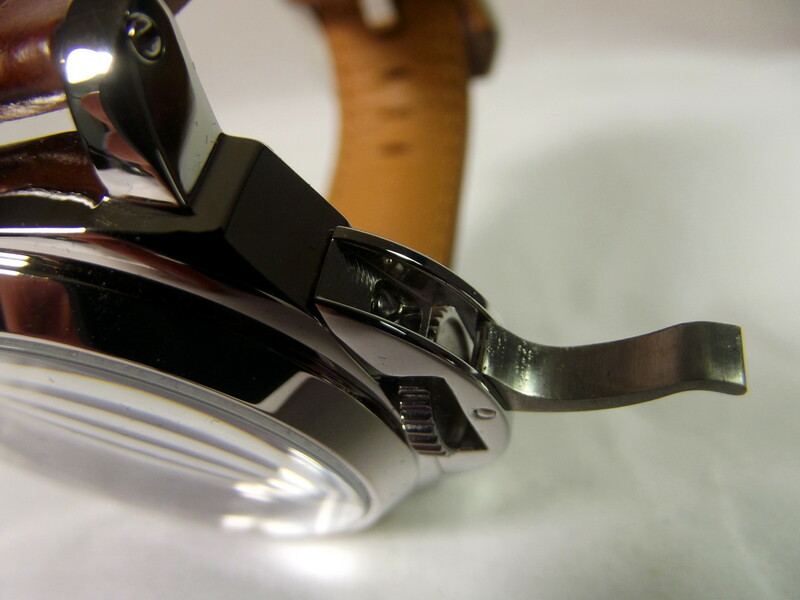 Panerai utilizes a roller which is fitted to the lever. As the roller is forced against the crown, it turns. This action reduces wear and tear, ensuring the device will operate properly for many years. 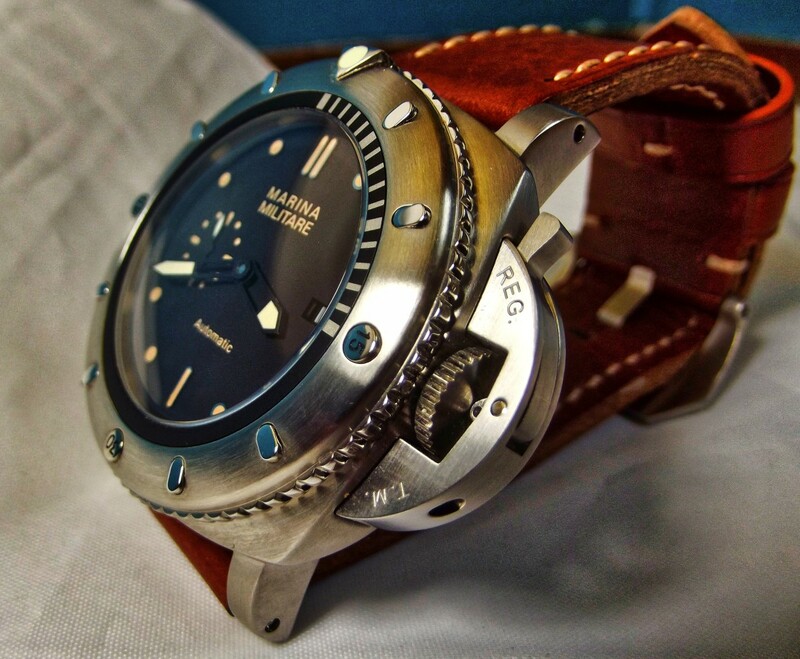 The heart of the Marina Militare is its Asian 6497 mechanical movement. I compared this one to its Seagull manufactured brother and they appear identical. That makes sense, I suppose, because both are based on the Swiss ETA 6497 pocket watch movement. This timepiece is very accurate and the movement should last for many years. Parnis equipped this watch with a thick and durable leather strap. While it fit me well, it is not particularly long. Those with larger wrists may need to purchase a replacement strap. Considering this timepiece was named after the Italian Navy, you would expect it to be highly resistant to water ingress. Sadly, the Marina Militare is rated 3ATM. Don’t wear it in the pool. I love this watch and have ordered another, slightly more expensive, Marina Militare from mywatchcode. 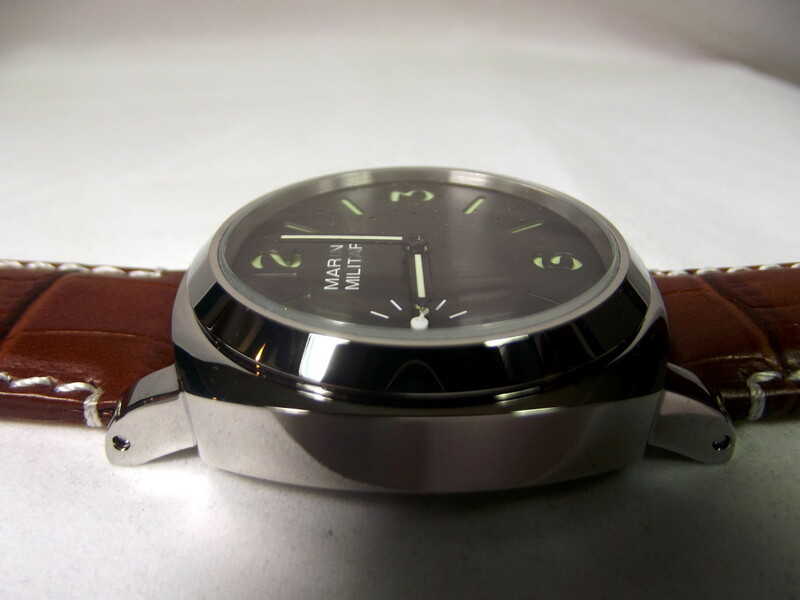 If you are looking for a good quality Panerai look-alike, Parnis’s Marina Militare carries my highest recommendation. Back in the days when I was wasn’t so darn old, every watch I owned was plastered with luminous paint. Some of them were even slightly radioactive. Lately though, except for digital watches, I’ve noticed that glow in the dark timepieces are becoming less and less common. The accompanying poll is an attempt to measure how important luminous paint is to the average watch wearer. 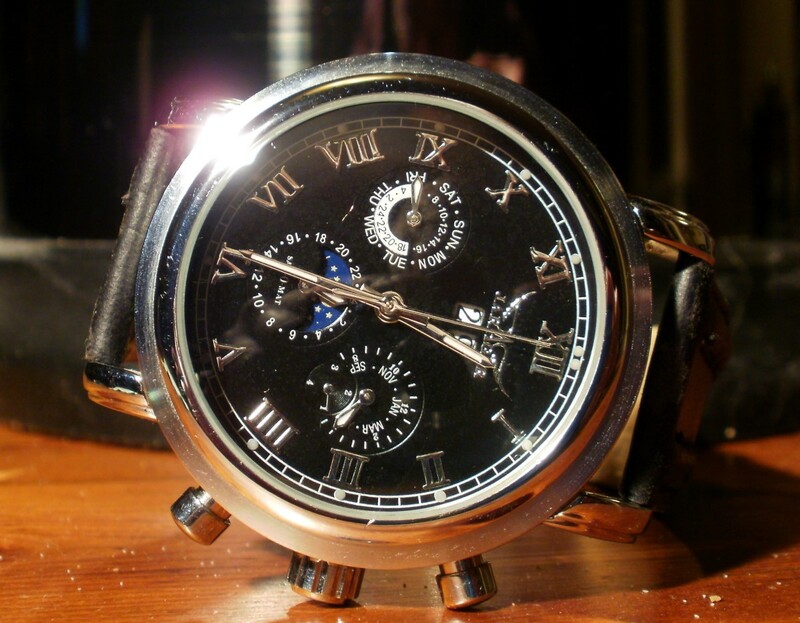 Is it important that your analog watch be coated with luminous paint? Of course. How else could you tell the time at night? It would be useful at times. I don't really care. If I need to tell the time at night, I'll pull out my cell phone. How has your Marine Militare watch held up over time? Wish I had seen this article sooner! Would have loved to get one of these at the discount but it looks like they've sold out. Another great review. 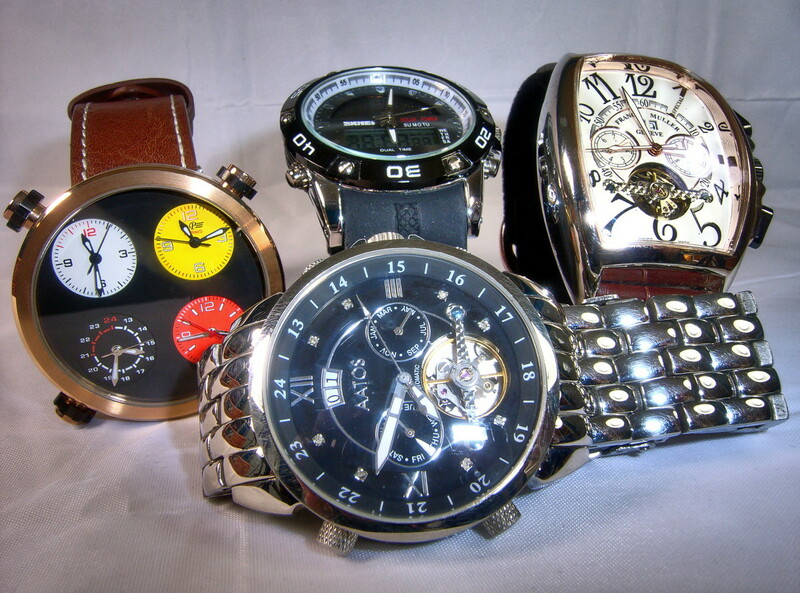 It seems to me that overall, Parnis provides quality and accurate watches at reasonable prices. I also like for my watches to have lume. I have a Parnis Power Reserve watch which has been very accurate and of good overall quality. This model is new to me, but worth checking out. Keep up the great reviews! !